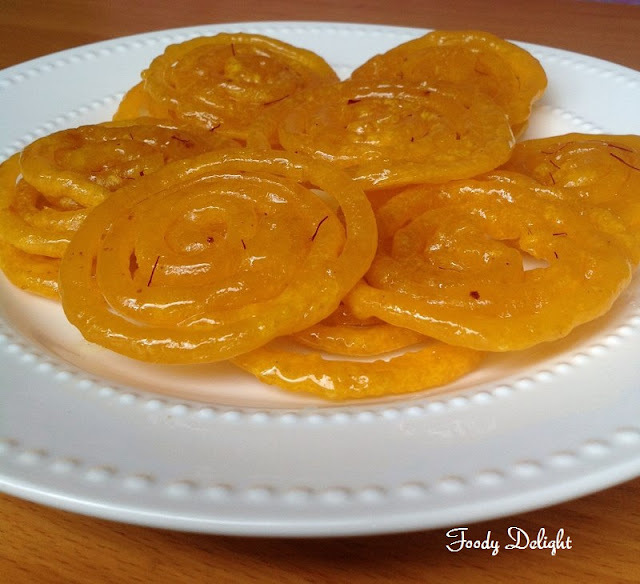 Jalebi is the popular traditional sweet prepared in India and Pakistan. It is made by deep fried batter in pretzel or circular shapes, which are then soaked in syrup. The Jalebis are served warm or cold. They have a somewhat chewy texture with a sugar glazed exterior coating. Jalebi is a really mouthwatering sweet item that can satisfy the taste buds of your loved ones. Combine all purpose flour, yeast, sugar, corn flour, yogurt, cardamom powder and oil into one big bowl and mix everything well. Prepare a thick batter by adding little by little lukewarm water. Place the batter bowl in the warm place and let it rise for about 30 minutes. Meanwhile combine sugar, water and lemon juice into one pot and keep it to boil. Once the syrup comes to boil, turn the flame to low and simmer the syrup till you get the two thread consistency. Then add cardamom powder and saffron strands .Mix well. After 30 minutes, check the batter and mix well and fill the batter into jalebi squeezing bottle (you can use ziplog bag or tomato ketchup bottle). Heat the oil into the pan on the medium flame. Then turn the flame to low and squeeze out the jalebis into circular shapes. Fry the jalebis till light golden in colour and crisp on both the sides. 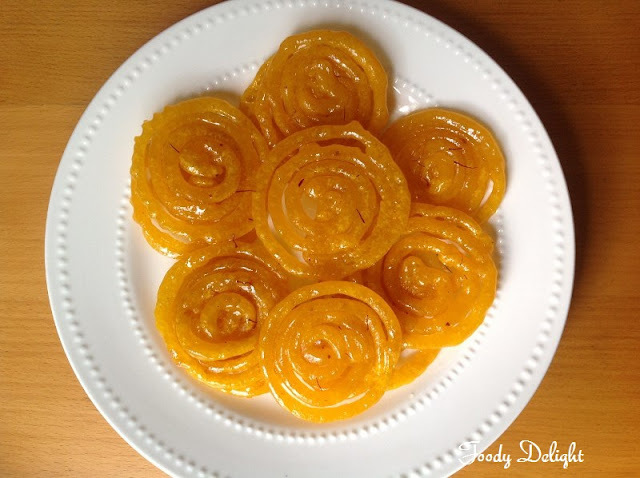 Drain the excess of oil from the jalebis and put them into the sugar syrup. 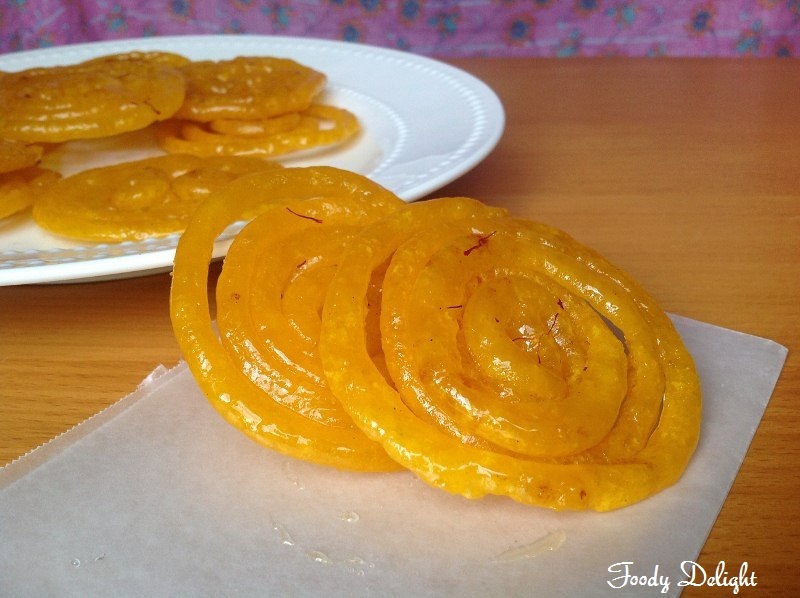 Allow the jalebis to remain the syrup for 20 seconds and then remove on to the plate. Jalebis are ready to serve. 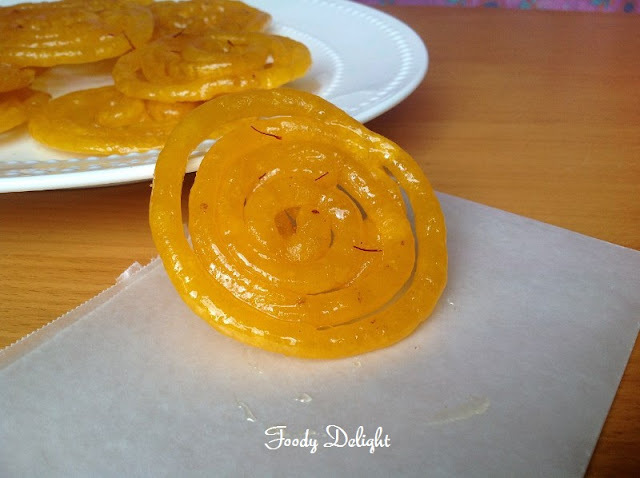 Delicious and perfect jalebi...nice one..
hey pranjali, your jalebis are so perfectly shaped, I never get that perfect shape. sp it didn't made its way to blog. yours is fantastic. any tip that you can give me for that?? Perfect shapes & mouthwatering dear,love these a lot!